This is a 1921 photograph of the Bengal Legislative Council with the Governor of Bengal, the Earl of Ronaldshay (later Secretary of State for India and known as the Marquess of Zetland) at the centre. To his immediate right is Surendranath Roy, then President of the Council. Seated second to the left of the Governor is Surendranath Banerjee, the eminent leader of the Indian National Congress (and mentor of GK Gokhale and other “moderates” in the national movement); he and Surendranath Roy were friends and political colleagues. 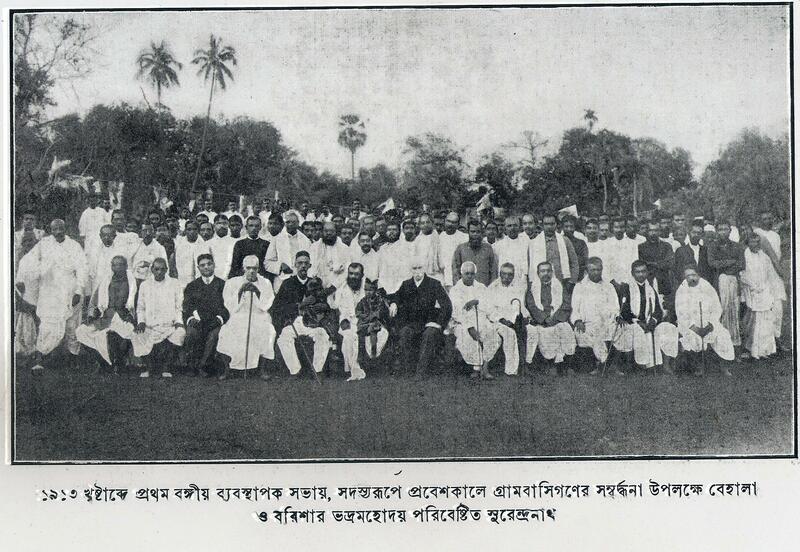 This is a 1913 photograph of the Indian members of the first Bengal Legislative Council elected (in 1912) after the 1909 Morley-Minto reforms; the members apparently were being greeted by gentlemen of the sub-urban areas south of Calcutta. The Englishman sitting at the centre seems to be Sir Henry Cotton (1845-1915), the 1904 President of the Indian National Congress and a great political friend of India. To his right sits Surendranath Roy, who may have been the Council’s first President. Other studies of the period include John R McLane, Indian Nationalism and the Early Congress (Princeton 1977), Anil Seal, The Emergence of Indian Nationalism (Cambridge 1971), Gordon Johnson, Provincial Politics and Indian Nationalism (Cambridge 1973) etc. By way of incidental reference, the young Jawaharlal Nehru had returned from his studies in England in 1912; MK Gandhi was still in South Africa and would not be returning until 1915. The Tilak-Gokhale clash though had been in full swing since 1907. Nota Bene: The text and photograph in this post may be considered in the public domain and may be freely used for purposes of a Wikipedia article or any other publication in the common interest.